A couple of weeks back we started talking about designing your garden – something people often want to do in spring. If you read that first part – and if you didn’t, you can find it here – then you already know we are not going to get out the drawing board, or buy some fancy computer program, and then spend hours thinking about the perfect garden. No, much better is to get outside and start doing the garden instead. Not crashing around without a plan, but designing on the ground, by looking around and deciding what you actually want your garden to be. Of course, you will at some point have to start measuring and laying paths and beds carefully, but first you need to get a feel for what you have, and what you want. If you read and followed that first blog, you will by now have a list of your garden assets – trees and healthy plants you want to keep or views you don’t want to block – as well of things you do want to remove or put some screening in front of. You will also have a ‘wish-list’ of things you want in your garden – a barbecue area, space for the kids to play, a vegetable garden, curb appeal – whatever you want, to enjoy your garden more. 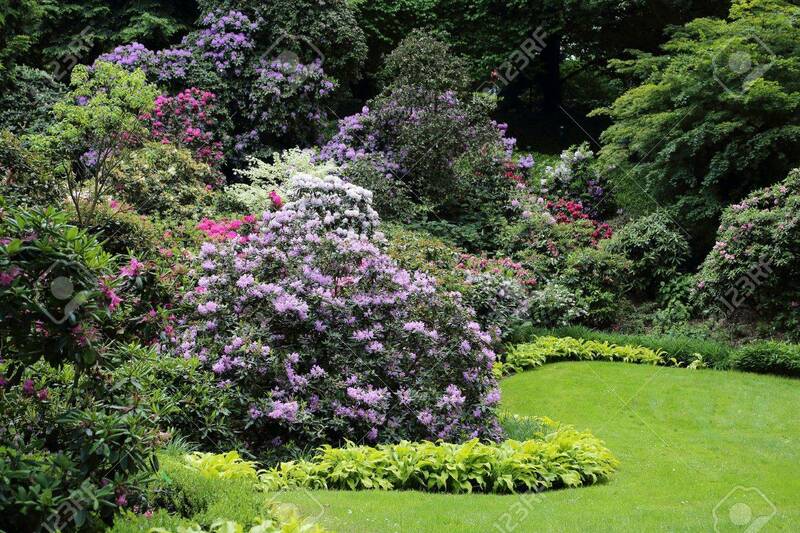 You might also have taken a look at garden pictures you like, to see what style you want, and maybe considered how much time you have to take care of this garden – no point in taking on something you can maintain. In our thoughts last time we emphasized considering the style of your home and choosing a garden style that fits. Building a full-blown Japanese garden around a colonial home is not going to work, but if your heart says ‘Japanese’ and your house says, ‘colonial’, the solution is the other idea we talked about last time – garden rooms. Hedges and screens take a while to grow, so it makes a lot of sense to get them in the ground first. They will also define the spaces you have, and when you see those areas, there is a good chance you will be inspired to do something with them. A common mistake is to put a big hedge right around your property – or at least on 3 sides, and then stare at that big, blank space. No, think instead about using screening and lower hedges to create rooms, exactly the way your house is laid out indoors. The ‘walls’ can be clipped hedges, more natural rows of upright-growing plants, or beds of shrubs and small trees. Beds take up the most room, so while they are great for dividing spaces in larger gardens, in smaller ones they can quickly fill the whole garden, so be cautious. Consider shade too, and don’t put in taller plants where you only want a low screen. The taller the screening, the more shade it throws, and the more limited you will be on planting inside that space, so keep the heights minimal. We can distinguish between screening that blocks a view completely – an evergreen hedge for example, but remember that even there, a 6-foot hedge will give complete privacy – you don’t need a 15-foot monster! The idea of a boundary can be created with a row of plants just a couple of feet tall, and often that is all you are going to need. If you want that Japanese garden with your colonial house, a hedge you can’t see over will be needed, so you have a private place to create a Zen retreat that won’t clash with the look of your home. On the other hand, if the ‘wall’ is around your vegetable garden, a row of raspberry plants, or thornless blackberries, attached to some wires stretched between poles, will give you visual division, while letting in plenty of light, and still showing off those beautiful rows of lettuce and cabbages. You need to get around your garden, but paths can simply be grass, if they don’t get a lot of traffic. 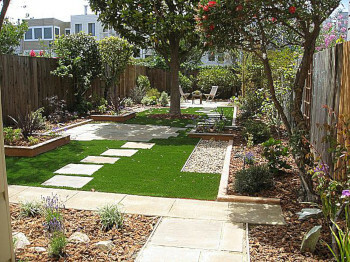 Don’t pave everything over – it’s expensive, and mowing grass doesn’t take so long. Follow direct routes from A to B – no one wants to go the long way around for no purpose. Use straight lines for more formal gardens, and sweeping curves for a more relaxed look. Don’t put the path to the front door straight from the road – how about off the driveway, or coming in from the corner? You get the idea. Trees give a real sense of permanence to a garden, as well as welcome shade in summer. But many grow large, and there is nothing sadder than seeing a 30-year-old tree being cut down because it has outgrown a space it should never have been planted in. Think carefully about where to plant trees, because they are going to be in that spot for a long time. As a ‘rule-of-thumb’, never plant a tree closer to a building or boundary than half its maximum width. Further away is better. Many traditional trees, like maple, oak, or southern magnolia, grow large, and with today’s shrinking lot sizes, they are simply too big. Consider instead one of the smaller varieties of these trees – the Teddy Bear Southern Magnolia for example, if you love the tree, but don’t have the room for the classic version. A silver maple can grow over 50 feet tall and wide, and engulf a garden, leaving no room or light for much else. On the other hand, there are fast-growing Japanese maples that grow 15 to 20 feet tall, and they are often much better choices for smaller places. Birch too are fast and throw a nice area of light shade. Flowering trees have leaves too, and many make good shade trees after their flowering, and of course a fruit tree can serve triple purpose, giving flowers in spring, shade in summer, and a harvest of home-grown goodness in fall. Many people spend a lot of time considering what to buy, but if you have some space to fill, a really simple approach is to start of with things you like the look and sound of, and then get a bunch, but for this first round, don’t get too much. Go out into the garden, and start playing around with them, as you might with your furniture indoors. Take a tape and measure how wide they are expected to grow, and just stand them around the garden, thinking about creating those ‘rooms’ for your activities. Now, what are you missing? An accent plant in that corner over there? Some rounded bushes to soften the edge of your house? Something flowering to plant underneath that tree? Time for ‘round two’, where you now look for quite specific plants, that will complete the picture, the way you got that rocking chair to put in the empty corner of your living room, remember? Next time, to finish this instant guide to garden planning, we will look at some basic things to consider when making those choices, especially for that ‘second round’, where you really want to achieve a balanced look in your garden. For now, organize those basic hedges and screens we started with, to make your outdoor rooms. Choose your major trees, and start browsing the site, making a note of things you simply like the look of. Check back for Part 3 or this ‘no-plan’ approach to garden planning.